In a previous blog post I have discussed how we need to identify each and every touchpoint with our brand to examine how we can use them to build it, and how we need to make sure that we consistently deliver the same brand experience through each of those touchpoint. This is not enough though. 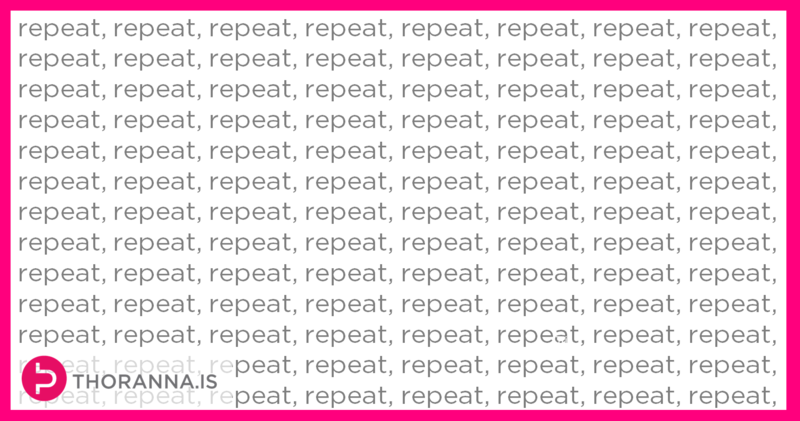 You also have to remember to repeat, repeat, repeat, repeat, repeat and repeat again. It’s Great to Be Bored! Repetition is absolutely key in marketing and I can promise you that if you are doing your marketing right, you will get bored. You will get bored of your brand identity; your colours, fonts, images etc., you will get bored of your marketing materials; your advertising, messaging etc. You’ll get bored with the whole thing. Absolutely, you’re going to get bored! But the thing is, you’re always working with your brand, you’re always looking at it, thinking about it, it’s always there. However, you’d be really lucky if the people you are trying to reach see 1% of what you are up to. So you must remember that it’s not about you. It’s about them. You’re going to get bored but you have to pull through it and just stick with it! The thing is if you start changing things up, changing your messaging, changing the look of what you are sending out, whether it is advertising, brochures, stuff on social media, blogs or whatever it is, you end up at square one again. We all know how many things are there out there vying for people’s attention each and every day. So when you start changing things up they’re not going to recognize you. You’re going to have to start building awareness and recognition all over again. However if you stick with it and you stay the same, you’re going to be strengthening their memory structures of you in their minds and they’re going to end up sticking. It’s a bit like a game of snakes and ladders. By constantly keeping at it and doing consistent marketing, you move up the board. Then occasionally there is something big, you may get some great media coverage, or do a very successful campaign, and you climb that ladder up the board, skipping some of those squares on the way all together. If you then start changing things up too much, change your message, change your identity or anything like that, that snake is going to grab you and you will slide right back down! Another thing to consider with regards to repetition, apart from awareness and recognition, is trust. People buy from people that they know, like and trust. And brands that they know, like and trust. And repetition builds trust. It’s a bit like with people. We all know somebody that we don’t feel quite comfortable with because “I don’t know, I just never know where I stand with that person.” And its the same with brands. If we aren’t consistent and people don’t know exactly what they’re getting, they’re going to start thinking: “Uhhhmm.. I don’t know quite what this is.” That’s going to erode any trust that you may have built. Here’s another little story to illustrate: Say you go to the gym each week always at the same times, and there is someone always there at the same times as you. You don’t know them, you never speak to them, you don’t know their name but they’re always there. You keep seeing their face. Now, say you go to a seminar and you don’t know anybody there but you see that face that you’ve seen at the gym time and time again. When the instructor tells the participants to pair up for an exercise, who is the first person you’ll be drawn to? Chances are it will be that person that you’ve seen time and time again at the gym because you feel like you know them and can trust them just because of the familiarity that repetition brings. It works exactly the same with brands. You need to see them again and again and again. They more you see brands, the more familiar they become and the more you trust them. That’s yet another reason you can’t keep changing things up all the time. You have to be consistent and repeat, repeat, repeat, repeat and repeat some more. Are you repeating yourself enough?